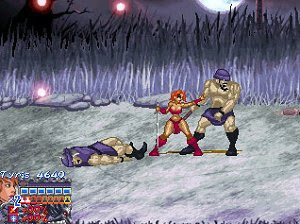 The mythical Golden Axe series still has a lot to offer players, and most of it is through amazing fan remakes such as Golden Axe Myth. Italian fans created this freeware game with an amazing attention to detail and it is certain to keep players glued to the screen for quite some time. Once again the free engine OpenBor is used for this side scrolling beat’em up, offering us fantastic 16-bit retro-styled visuals, smooth animation and polished gameplay that honors the classic in which it is inspired. There’s a nice touch in the addition of different paths to reach our final destination, a clear indication that a lot of attention went into the development. Those who want to know more about Golden Axe Myth must download the exclusive artbook with 44 pages and the OST featuring 32 tracks created by Gianluca Pappalardo and Oscar Celestini. This shows the true love and dedication of the creators for one of the unforgettable arcade classics that never had the right update for our times – Sega’s Golden Axe: Beast Rider was far from the game it should have been.